CLICK HERE to set up your free account now! Ensuring that your Vendors have the proper documentation is the first step in protecting your company, properties & clients from potential liability. In order to currently maintain your Vendors’ insurance certificates and licensing, without MyVendorCenter, you must manually and laboriously keep up-to-date records for each Vendor in their own folder. This could be time-consuming and inadequate, especially for those that may need the most current policy right at their fingertips, minutes before a board meeting. There’s no better way to save time and provide instant access to those documents than with Vendors that have their own MyVendorCenter account. Vendors on MyVendorCenter are required to submit their own Compliance Documents for verification, which are stored online for easy access and downloading. We even send out automated email reminders prior to the expiration of their documents on file – ensuring you have up-to-date info. Requiring your Vendors to set up a MyVendorCenter account will best protect your communities while helping you stay organized. 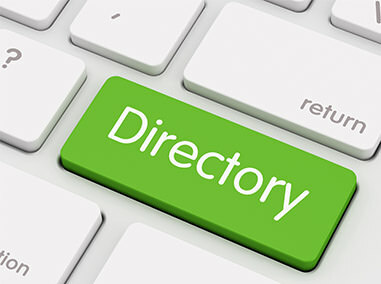 Easily Manage Your Own Vendor Directory Online. Keeping stacks of business cards, a paper list, or even an Excel sheet as your Vendor database isn’t as effective as keeping a Preferred Vendor list on your MyVendorCenter account. 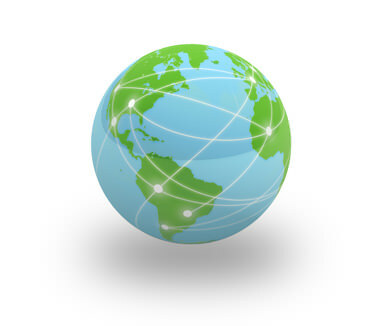 By ensuring that all your Vendors have a MyVendorCenter account, you’ll have their number, address, fax, email, and more whenever you’re online; additionally, any changes in a Vendor’s contact information will be made by the Vendor and automatically updated to your Preferred Vendor list. This means no wasted time having to worry about incorrect contact information on your Vendor spreadsheet or outdated business cards. In addition to your own list, MyVendorCenter gives you access to ALL Managers’ lists within your own firm. This replaces the need to make multiple phone calls to multiple Mangers with one, simple click. Every Vendor that you invite into MyVendorCenter, and current members, will come with their own, unique Vendor Rating. A Vendor’s rating is based off of every Manager’s review of that Vendor, per project. MyVendorCenter ONLY allows a Manager to rate a Vendor after they were hired through their online account, eliminating the possibility of fraudulent reviews (a common problem online). 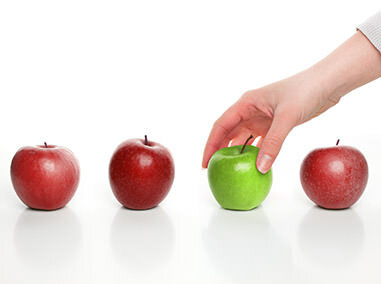 And because this Apple Rating is available on every Vendor Profile page, Project Status page, and Proposal Report, your association can be certain to choose the best Vendor for the job. With MyVendorCenter, you have the ability to set minimum standards with regards to license and insurance needs on a per-project basis. Having standards up-front ensures that you are bidding your associations’ jobs to equally qualified vendors. Why waste time qualifying each and every Vendor when you can have your MyVendorCenter account do it for you? We don’t just offer amazing technology for you to bid out your projects online; we created it from the ground up with your firm’s needs in mind. While creating your own request for proposals, you’ll have access to industry-specific, project wizards that assist in creating a more-defined scope of work for your Vendors to bid, resulting in an apples-to-apples itemized comparison. 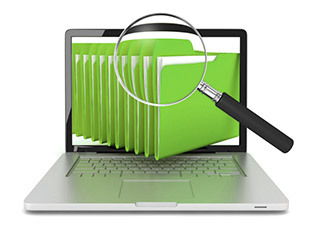 You can also securely upload documents, photos and architectural plans to any project for Vendors to reference. 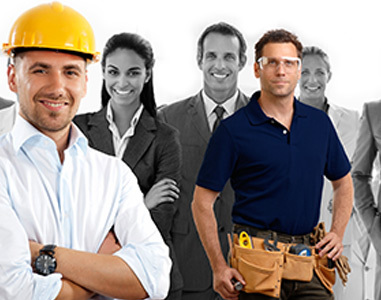 Your MyVendorCenter account also allows you to invite your own preferred Vendors, as well as other qualified Vendors invited by other Managers, to any of your project requests. You’ll also have a real-time, on-screen snapshot of the progress made by each Vendor in the bidding process. Once your proposals are received, MyVendorCenter will generate your own Proposal Report to simplify the Vendor review and selection process. 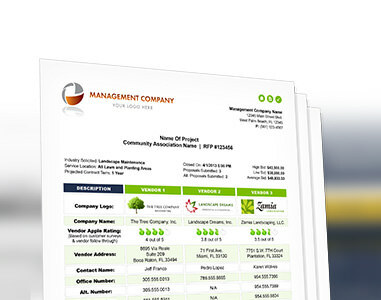 Your Proposal Report comes complete with your company logo at the top. Need to re-bid a job, or re-use a previous request? No Problem. MyVendorCenter allows you to send out project addendums AFTER your initial request is sent out, while automatically emailing all participating vendors so they can review your updates and adjust their proposal – even if it was already submitted. With options for sealed bids and board member approval of your project requests prior to bidding – you will be able to automate communication and save time. In addition, awarding a project online sends an email to the awarded vendor while also automatically sending a polite rejection email to the other participating vendors. Manually keeping records of the many projects for your communities can be burdensome and unreliable. With a MyVendorCenter account, everything from the Scope of Work (SOW) to the Proposals received from pre-qualified Vendors are retained online. This means revisiting projects, contacting Vendors about warranty issues, renewing your copies of a Vendor’s licensing and insurance, reviewing proposals or even re-bidding projects is just a click away. Having all of your Vendors participate on the same scope, while recording the entire process online will give you a better opportunity at keeping your project records consistent and accessible anywhere the internet is available. 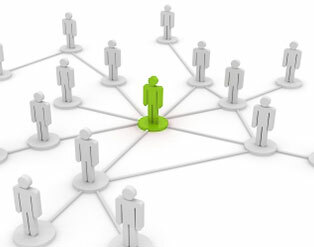 Anyone can create a Manager Account with MyVendorCenter. However, you can enjoy additional benefits as a company when you have all your managers tied into the same account. Benefits include multiple permission levels including a “Firm Administrator” (to adjust global settings) as well as a “District Manager” who can oversee subsets of managers (and their project requests). By having all your managers assigned to your company, they automatically share their Preferred Vendors among each other for a comprehensive vendor list.